Joy Creek Photo Archive (c) all rights reserved Clusters of small, waxy white flowers offer their fragrance to the spring garden. These emerge from unusual strands of buds that formed during the pervious summer and fall. The flowers are showcased in new foliage that is bronze in color. As they mature the leaves turn green. In Pieris j. 'Compacta' the leaves are small and the growth of the overall plant much slower than in the species. 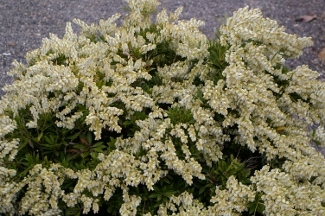 In our garden, this evergreen shrub remained under four feet during its first 15 years. Over time, it may reach 8 feet. April. 3-4 ft. x 4 ft.